Forest Meditation is a website dedicated to the Buddha, the Dhamma and the Sangha. The main purpose of this website is to share Buddha's teachings with whomever that visits these pages. Also, it is my intention to share info on the temples that I have personal knowledge of. Most of what you find here is from the Theravada Tradition, specifically Thai Forest Tradition. Please with any suggestion. Admission is free. Please bring a friend. Vegetarian food will be provided during break. 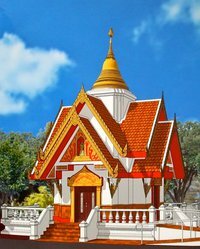 On May 28 and 29, 2011 there will be a blessing and dedication ceremony to celebratethe newly built pagoda at Buddhist Temple of America. The pagoda will house 108 different relics of the Buddha and other Awakened Ones. Approximately 50 monks will be attending. Monks from different parts of United States, plus 12 Ven. Abbots from 12 Thai forest monasteries and 5 junior monks from other Thai forest monasteries. New audio file, An Invitation to the Devas, recorded by Kat Haysom of Riverside, California. Please see the Blessings section on the Audio File page. 4 new book titles added on Forest Dhamma Books. "Venerable Ajaan Khao Analayo - A True Spiritual Warrior", "Forest Dhamma", "The Dhamma Teachings of Acariya Maha Boowa in London", and "Amata Dhamma - Six Talks on Dhamma". Added Ajaan Paññavaddho's biography, Dhamma talks and photo album. Venerable Ajaan Paññavaddho was for 41 years the senior-most Western bhikkhu following Ajaan Mun’s path of practice. Ajaan Panya, as he was called, was a man of intellectual brilliance who, through his own efforts in meditation, was able to establish a strong spiritual foundation in his heart. In this delightful fictional dialogue, an earnest but perplexed newcomer to Buddhism brings his basic questions to the wise and patient monk Tissa. A good read for the newcomer or for the veteran meditator who wants a light-hearted back-to-basics pick-me-up. 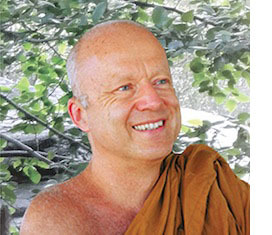 Two more enjoyable dialogues between the fictional monk Tissa and newcomers to Buddhism. In the first story, Tissa helps a well-to-do carefree young man discover that there is, in fact, much more to life than chasing after short-lived pleasures. In the second, Tissa helps a couple sort out a thorny ethical dilemma concerning their livelihood. A Sketch of the Buddha's Life: Readings from the Pali Canon. Buddhism in a Nutshell, by Narada Mahathera. A very basic beginner's outline of the Four Noble Truths. Basic instructions in the practice of breath meditation. Please use the navigation buttons on the left to further explore this web site.